Examples, videos, and solutions to help GCSE Maths students learn how to use the cosine rule to find either a missing side or a missing angle of a triangle. The following diagram shows the Cosine Rule that can be used to find a missing angle or a missing side of a triangle. Scroll down the page for more examples and solutions. 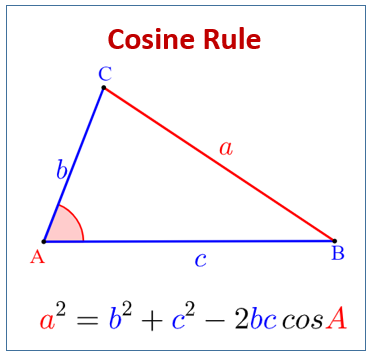 The Cosine Rule and how to use it in GCSE maths. This video shows how to use the Cosine rule to find either a missing side or a missing angle. This question is on the cosine rule.